Strolling in a garden in the cool of the morning, coffee in hand, admiring foliage combinations and looking for new blooms, insects and birds is made so much nicer when a well-designed and properly constructed path guides me through it, creating a feeling of cohesion and calm. But for many gardeners, the lure of selecting and collecting plants tends to overshadow the more practical aspects of creating a garden, and paths are an afterthought. Paths can have many functions. Utilitarian paths that give access to sheds, compost bins, garages or driveways should be a minimum of three feet wide or large enough to accommodate your wheelbarrow, garden cart, shopping cart or bicycle. Direct paths, with no sudden changes in direction or steps, work best. The surface material should be smooth. 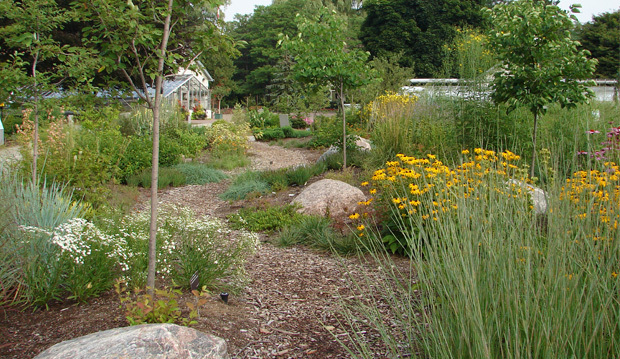 Maintenance paths that provide access within wide garden beds for weeding, deadheading, transplanting, fertilizing and mulching are usually hidden from view by the surrounding plants. These narrow paths wind through the garden beds and can be mulched or made from stepping stones placed 18 inches to two feet apart. When laying out these paths, keep in mind that most gardeners can reach in three feet (more with long-handled tools). Viewing and strolling paths can have hard (natural flagstone, man-made pavers, brick, pea gravel, shingle) or soft (mulch, grass, groundcover) surfaces. These materials can also be combined to create interesting effects. Square cut stone gives a more formal look than random pieces of flagstone. Set the random flagstone in pea gravel, and the path becomes even more casual. Square cut flagstone set in grass is formal but looks softer than stone alone. These paths should be at least four feet wide so that two people can stroll together. Paths are more than just a surface to walk on. They create direction and organize a garden. 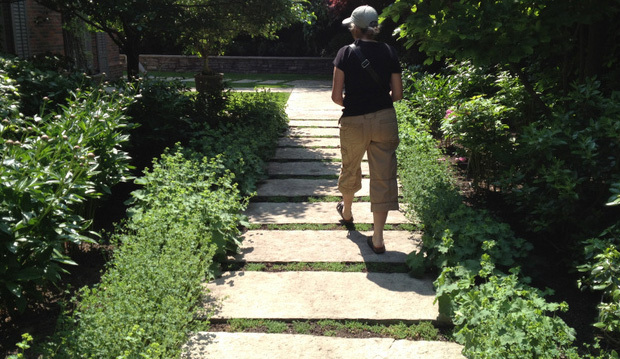 Straight paths invite you in and lead you through the garden both physically and visually. A statue, a container with interesting plants or a fountain placed at the end of the path creates a pleasing end to the journey. Indirect or meandering paths slow the journey through the garden, allowing you to see it at a more leisurely pace and to focus on the plants. The garden unfolds a bit at a time. Well-thought-out paths are both useful and beautiful. So take a stroll around your garden and imagine how a new path could help you better showcase your plants.